Ok, yes it is only for pretend, but I do believe some day I will get to do a celebrity wedding and if Nicole wants me to do the flowers for her wedding I would be happy to help. As a mother of seven kids, I have to admit that I get a big kick out of looking up and seeing my designs in a national magazine. I mean really, to stand there looking over the mountains of food, formula, and diapers our family requires and realize that I am more than just a mom is really, really, cool. I know my teenage daughters got a mini thrill out of this as well. Here is the bouquet that caught the eye of the staff at In Touch Weekly. The bouquet really belonged to my bride Amanda who married last June at Lansdowne Resort. The photography was done by Andrea at The Observatory. 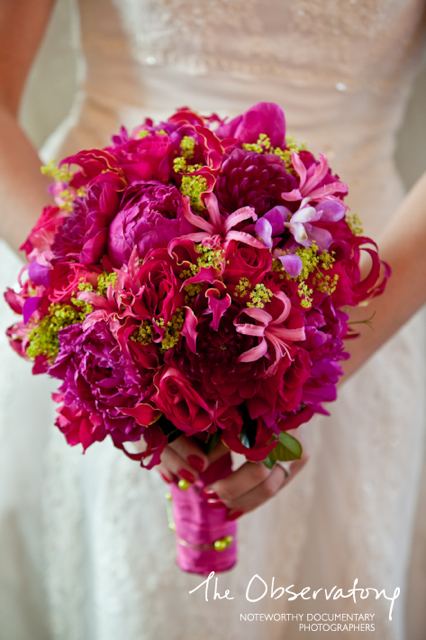 The bouquet was created of crimson colored dahlias, peony, gloriosa lily, pink orchids, nerine lily and a green filler called alchemilla. Big fun day at The Full Bouquet. I said this on Twitter, but I felt it was worth repeating . . .
Nicole would be a lucky girl if she took the magazine’s advice and chose your bouquet. Because honey — that bouquet is awesome! wow! how exciting 🙂 such a pretty bouquet, too! Congrats Holly! What gorgeous bouquet! wow miss holly. i am thrilled to know you and so proud of your accomplisment! hi – i just found your blog…i’m interesting in finding out what dress Nicole Richie is wearing in the In Touch article above on the right? the long white halter dress? do you know?